An application has been made to the Texas Commission on Environmental Quality (TCEQ) for construction of a new wastewater treatment plant (WWTP) that would discharge to the headwaters of Geronimo Creek. The proposed WWTP would be located approximately 3,800 feet southwest of the intersection of State Highway 123 and FM 758. The discharge route will be from the plant site via force mains to a man-made ditch, then to a tributary of Geronimo Creek. The WWTP is to supply wastewater treatment for a proposed 1,000 home subdivision. Feral Hog sightings or damage? There is a new, innovative tool that will let landowners easily report wild pig activity and damage. Read more about it here. The reporting tool is part of the Texas A&M Natural Resources Institute - Wild Pigs website. Click on the "Report Wild Pigs" link for the reporting tool. Geronimo Creek and its tributary Alligator Creek are located in Comal and Guadalupe Counties, and lie within the larger Guadalupe River Basin. The headwaters of Alligator Creek begin in southeastern Comal County, just above Interstate 35 near New Braunfels. Alligator Creek flows southeast towards Seguin until about midway in the watershed where it joins Geronimo Creek. 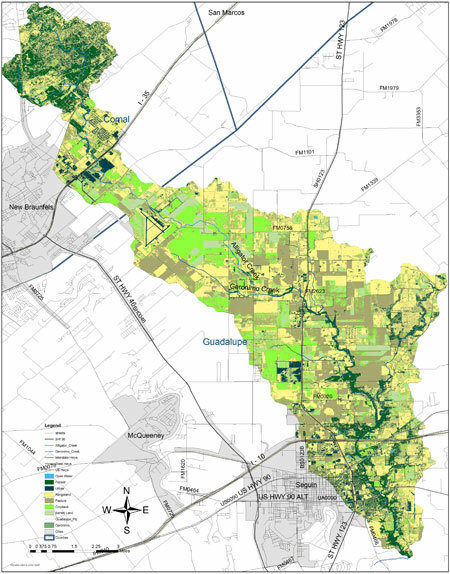 The majority of the Alligator Creek watershed lies within the extra-territorial jurisdiction (ETJ) of New Braunfels, while the majority of the Geronimo Creek watershed is almost entirely within the ETJ of Seguin. Geronimo Creek is monitored by the Guadalupe-Blanco River Authority (GBRA) as part of the Clean Rivers Program. Geronimo Creek is listed on the Texas 303(d) List with a concern for nitrate-nitrogen and an impairment of the contact recreation use, due to elevated E.coli bacteria concentrations. Starting in 2009, development of the Geronimo and Alligator Creeks Watershed Protection Plan (WPP) was initiated by local stakeholders with the primary goal being to restore and protect water quality and designated uses of the creeks through voluntary, non-regulatory water resource management. Shortly after development of the WPP was completed, it was accepted by EPA on September 13, 2012. Public participation is critical throughout implementation, as ultimate success of any WPP depends on stewardship of the land and water resources by landowners, businesses, elected officials, and residents of the watershed. The Geronimo and Alligator Creeks WPP defines strategies and identifies opportunities for stakeholders across the watershed to work together and as individuals to implement voluntary practices and programs that will restore and protect water quality. You can become an active member of the Partnership by participating in meetings, signing up for email updates, and becoming involved in implementation of the WPP, as well as telling others about this important project! Simply contact Ward Ling under the Contact Us tab.